Located in Serian, Kota Samarahan Division near Bantang Village, Kuching, Serian road. Gua Sireh is an important archaeological site in South Western Sarawak. Excavation works have recovered pottery shreds and food debris as animal bones and shellfish. The cave could have been occupied as early as 20.000 years ago. Pottery was produced around 4.000 years ago. At the same time domesticated animals (dogs and pigs) and plants (rice) were introduced. One shred with rice temper was dated to around 3500 BP, which is a comparatively early found for rice cultivation in island Southeast Asia. According to our guide Mr. James and supported by local guide from Bantang Village, Mr. Ekol, human burials with heads and iron objects were placed in the cave about 2.000 years ago. The cave was used as refuge site and for birds nesting activities in recent time where birds nest collecting tools still can be seen. Ancient charcoal drawing which is mostly found at the cave entrance, depicting human and animal motifs were drawn on 36 lineal meters of the interior walls. The cave entrance are also used as place to cremated the warrior bodies, that why the above part of the cave entrance are blackish color (singed of burning activities). The excavation area and cave painting at the cave entrance is blocked (fencing) and locked by Museum Department. According to Mr. James, the key need to be retained from them because the padlock has been changed. 0840hrs – Pick up from STB headquarter lobby by KISTours Sdn Bhd. Using 2 4X4 vehicle to the caving venue. Along the way, Mr. James telling us brief history about Jalan Keretapi which is now known as Jalan Tun Zaidi Adruce. He’s also pointing to us some potential caving area that need to be explore along the way, starting from 12th miles to 10th miles Kuching – Serian road. 0915hrs – Stop for briefing at KISTours Sdn Bhd office at 10th miles bazaar. You will need the right equipment, trousers, boots, towels and shirts. 1030hrs – Depart 10th miles bazaar. On the way to caving location, our guide sharing with on the potential caving area. 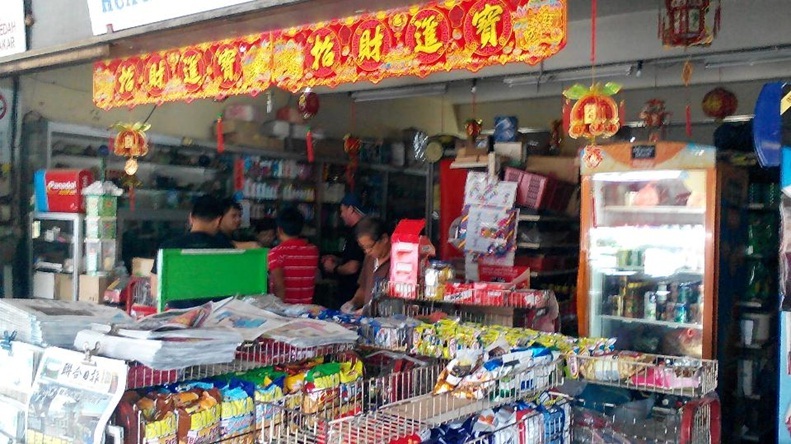 1115hrs – Making a quick stop to purchase our ration (snacks drinks) at Taiee Bazaar. 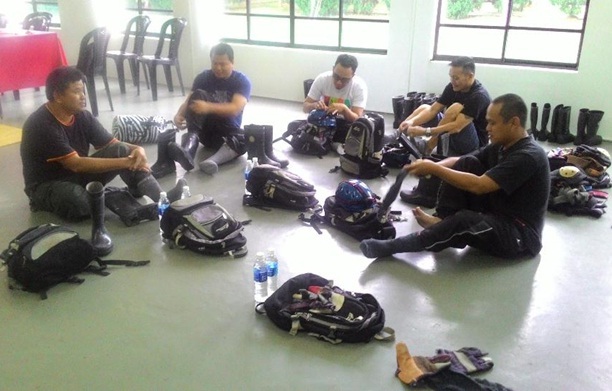 1130hrs – Reached caving location near Bantang Village. 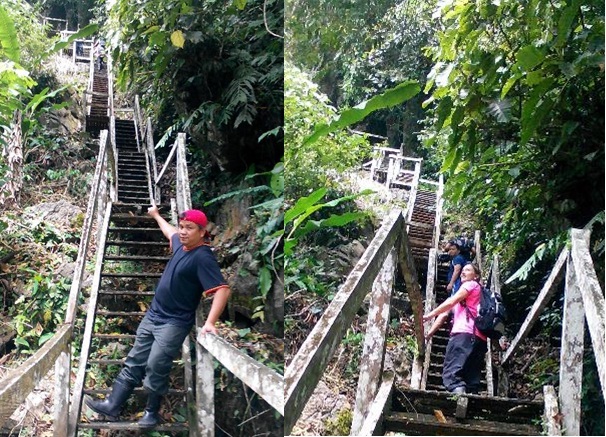 1140hrs – Moving in to the jungle path leading to the Gua Sireh. It takes about 5 minutes walk from jungle path starting point to the wooden plank staircase, than 15 minutes to claim the staircase up to Gua Sireh entrance. Plants found along the path. Staircase leading to cave entrance. 1200hrs – Journey to darkness begin…going into the cave. About 20.000 years old painting. There are difference kind of creatures living in the cave, such as snake – Cave Racer Snake, bats, insects, catfish and etc. 1425hrs – Our caving stop at “The Rapid”, which take us 2 hours 25 minutes to reached there. We had our snack break here, before turn back to cave entrance. 1450hrs – Depart The Rapid for cave entrance. 1540hrs – Reached cave entrance (going back is faster). The cave is relatively smaller chamber than the Gua Sireh. This is where we were required to submerge ourselves in the water. At some point, the water level was higher than my height and can be difficult even for good swimmer, but James and Mr. Ekol were very encouraging. 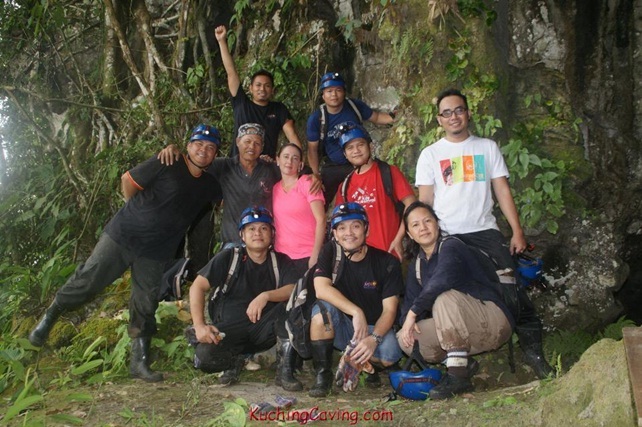 They were really determined to provide us with an unforgettable caving experience hence despite acquiring Noise-induced hearing loss from my loud screaming, they still helped us go deeper into the cave. James literally had to bring/carry us in to “inner room”. The Chamber was short, only about 250 meters. After seeing the inner room, we an option to either take the dry route to come out, or to go back using the same way we came in. Walking to the ‘Broken Jar’ cave. 1745hrs – Depart to Kpg Bantang. We return the equipment to our base (KISTours Sdn Bhd) at 10th Mile Bazaar after caving and finish with dinner at the local restaurant nearby (served no pork). The attractiveness level of Gua Sireh caving is beyond expectation. The product have a very high potential to market as a adventure tourism product and because of close proximity to Kuching city, highly recommended for short adventure holiday destination seekers. The overall organizing is good and the efforts concerning safety such as providing helmet, socks, boots and rope by the service provider are excellent. The safety and comfort of land transport to the location was good too. The involvement of local people is good, because the tours will bring us closer to the local community and the product nature. This what the eco-tourism all about… giving back to the local community in the area and preserving the nature.